This map of air flow a few miles above ground level in the Northern Hemisphere shows the type of wavenumber-5 pattern associated with US drought. 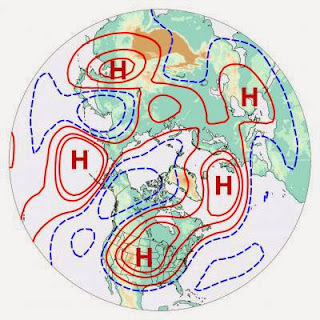 This pattern includes alternating troughs (blue contours) and ridges (red contours), with an "H" symbol (for high pressure) shown at the center of each of the five ridges. High pressure tends to cause sinking air and suppress precipitation, which can allow a heat wave to develop and intensify over land areas. Based on historical weather data, scientists have identified an atmospheric pattern called Wavenumber-5 as a factor that could lead to forecasting a heatwave fifteen to twenty days before it happens. An area experiencing unusual and excessive hot weather for a prolonged period of time is known to be going through a weather pattern called a heat wave. It is a phenomenon where the temperature for the period is much higher than what the climate for that area should be. Since a heat wave is relative to the area and its normal climate, the same temperature can be considered normal for people living in a hotter climate. Wavenumber-5 is a pattern or sequence of five high-pressure systems and five low-pressure systems alternating with each other to form a circle around the northern midlatitudes, several miles above the surface of the Earth (see image on the left). The 2003 heatwave in Europe, the hottest since 1540, was responsible for more than 70,000 deaths (mostly the elderly) and caused crop drought and forest fires throughout the southern regions. France was the hardest hit with around 14,000 deaths. By being able to forecast a heatwave weeks in advance, measures can be undertaken to minimize the health and environmental hazards it can cause. Scientists have fingerprinted a distinctive atmospheric wave pattern high above the Northern Hemisphere that can foreshadow the emergence of summertime heat waves in the United States more than two weeks in advance. The research team discerned the pattern by analyzing a 12,000-year simulation of the atmosphere over the Northern Hemisphere. During those times when a distinctive "wavenumber-5" pattern emerged, a major summertime heat wave became more likely to subsequently build over the United States. "It may be useful to monitor the atmosphere, looking for this pattern, if we find that it precedes heat waves in a predictable way," says NCAR scientist Haiyan Teng, the lead author. "This gives us a potential source to predict heat waves beyond the typical range of weather forecasts." The study is being published next week in Nature Geoscience. It was funded by the U.S. Department of Energy, NASA, and the National Science Foundation (NSF), which is NCAR's sponsor. NASA scientists helped guide the project and are involved in broader research in this area. To see if heat waves can be triggered by certain large-scale atmospheric circulation patterns, the scientists looked at data from relatively modern records dating back to 1948. They focused on summertime events in the United States in which daily temperatures reached the top 2.5 percent of weather readings for that date across roughly 10 percent or more of the contiguous United States. However, since such extremes are rare by definition, the researchers could identify only 17 events that met such criteria -- not enough to tease out a reliable signal amid the noise of other atmospheric behavior. By analyzing more than 5,900 U.S. heat waves simulated in the computer model, they determined that the heat waves tended to be preceded by a wavenumber-5 pattern. This pattern is not caused by particular oceanic conditions or heating of Earth's surface, but instead arises from naturally varying conditions of the atmosphere. It was associated with an atmospheric phenomenon known as a Rossby wave train that encircles the Northern Hemisphere along the jet stream. "There may be sources of predictability that we are not yet aware of," she says. "This brings us hope that the likelihood of extreme weather events that are damaging to society can be predicted further in advance."